Motocross is about to enter a new era. Introducing the all-new RM-Z450 with 2008 RM-Z450 Suzuki fuel injection. Our engineers developed the RM-Z450 using experience gained developing fuel-injection systems for Suzuki’s legendary GSX-R road race bikes and the championship-winning LT-R450 QuadRacer ATV. The result is the world’s only mass-produced, fuel-injected motocross bike, designed to help you blow away the competition. As if that breakthrough technology weren’t enough, our engineers used their experience developing Ricky Carmichael’s championship-winning RM-Z450 to redesign the RM-Z450’s chassis, suspension and brakes. That means it offers sharper handling, smoother suspension performance and more powerful braking than ever. And just so no one misses the fact that you’re on the hottest bike on the track, the RM-Z450 is also completely restyled, with new aerodynamic bodywork that’s both sleek and functional. The all-new fuel-injected RM-Z450 – it gives you the power to dominate. Hot start lever is relocated to the right hand side of the handlebar for easy operation while holding the clutch. Race inspired wave-rotors provide better cooling performance and increased mud deflection in muddy conditions. Gripper seat has been improved this year by adding projected cross-shaped patterns on the top surface to provide additional grip. Electronic Fuel Injection offers better roll on power and improved low-to-mid range power. KEIHIN throttle body specifically designed for motocross. Fuel is delivered via an internal fuel pump and is a battery-less system. 5-Speed Transmission makes the RM-Z450 more versatile for various terrains and features an all new link type shifting mechanism. Intake port angle and cam timing are revised and result in reduced intake resistance and heightened intake efficiency. Exhaust port and cam timing are designed to regulate exhaust pulses for maximum engine performance. Flywheel inertia increased to produce a smoother revving engine and improve overall acceleration feel. Airbox is constructed as a separate unit which is sealed by a lid to prevent air leakage and improve overall intake efficiency. KEIHIN fuel pump located inside the fuel tank provides stable pressure delivery to operate the fuel injection system. Redesigned combustion chamber for better power output and improved low-to-mid range response. Narrower intake and exhaust valve angle guides along with increased squish areas improve air/fuel mixing and faster flame-propagation speed when mixture ignites. Battery-less fuel injection system features a single-phase all-charging system with which the magneto supplies all of the necessary power. 18-pin magneto senses feedback on crankshaft position, rotation speed and stroke which is fed back to the ECU to calculate optimum injection and ignition timings. All-new frame is lighter and has improved rigidity balance for incredibly agile handling and unmatched performance over bumps. Slim riding position opens up the cockpit for additional room to allow the rider to actively take control of the machine. Showa cartridge-style front fork is fully adjustable for rebound, compression and preload settings and designed for reduced weight and improved shock absorption. Showa-brand rear shock absorber with a newly designed damper case and modified internal structure for a better controlled feel and increased bottoming resistance. Redesigned rear swing arm.Thinner wall thickness swingarm to reduce weight and improve terrain-traversing performance over bumps. Front number plate design helps guide fresh air to the radiators for better cooling performance. Front fender incorporates a sloped-down shape to efficiently guide wind to the front number plate air ducts for improved cooling performance. Rear fender incorporates air intakes on both sides for heighten intake efficiency while tying in a fresh new look. 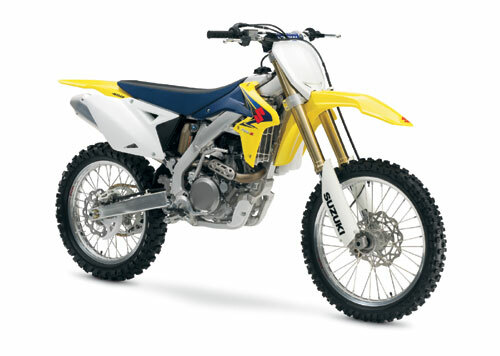 New 2-tone molded-plastic radiator shrouds give the RM-Z450 a slim feel and stylish look for 2008 while also complimenting an all-new graphics design and color way.Redesigned outer louver plates offer better cooling performance by improving airflow to the radiators. Newly designed pegs include increased clearance between the mounting bracket and footrest to prevent mud from caking up. Gold-colored chain give a full factory look.